Redbus founder Phanindra Sama and TaxiForSure founder Raghunandan G, have led an angel funding round in visual discovery platform Galleri5. The funds were received in October 2015 and are being utilised for content development, hiring talent, marketing strategies, and talent acquisition, said Rahul Regulapati, co-founder, Galleri5. The portal, run by Galleri5 Technologies Pvt. 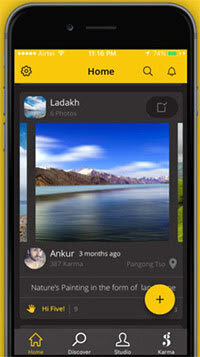 Ltd, is a community for visual content discovery. Users can upload their photographs onto the portal and can curate pictures from existing galleries. The startup was founded last year by IIM Ahmedabad and IIT alumni Rahul Regulapati and Movin Jain. Regulapati has previously worked with Adani Group, Booz & Company, and Deloitte, while Jain has worked with InMobi and Barclays Investment Bank. "Through Galleri5, users can discover places to visit, activities to try out, and recipes through authentic photos posted by like-minded people," said Regulapati. The portal claims to have 1300 regular users since its launch in February and around 4000 photographs. The startup now aims to strengthen its travel, food, and fashion visual content verticals. In the online visual content discovery space, one of the biggest players is Pinterest. The US-based startup had raised over $367 million in funding in March last year. In January this year, Snapshopr, an artificial intelligence (AI) startup that specialises in visual search and image recognition, has secured an undisclosed amount in angel funding led by former Flipkart chief technology officer Amod Malviya. In December 2015, Streamoid Technologies Pvt. Ltd, a visual-based search and discovery services provider for e-commerce and publishing industries, received $1 million (Rs 6.7 crore) in angel funding from two investors from Bangalore and Silicon Valley.